What are Synthesis Maps and Gigamaps? Strategic Innovation Lab has developed a repertoire of systems mapping methods and outputs to help understand and guide complex service design, social system design, and knowledge translation for complex systems research. The following pages present systemic design research and coursework examples drawn from project work completed in the Strategic Foresight and Innovation Systemic Design courses from 2011–2015, guided by sLab professors Peter Jones and Jeremy Bowes. Gigamaps are more "direct engagement in the relations of a system." Sevaldson explains Gigamaps in a well-regarded paper and in RSD proceedings. Gigamaps employ a research through design (RTD) practice of engaging directly with a system problem and following the contours of the complexity as expressed in a design space. Due to the coursework setting in which these are trained, often without access to direct stakeholders, we employ generative and ethnographic research to design. These are then "first phase" system maps that synthesize research, perspectives, and design problematics into coherent visual narratives that make sense to stakeholders knowledgeable in these domains. Our hope with student work is to demonstrate the possibilities of synthesis maps to reveal systemics and propose design of future options. These become proposals for continuing with in-depth stakeholder work such as published by sLab to date.They serve to communicate complex concepts visually for service design, and as descriptive artifacts for presentation in conferences and publications. 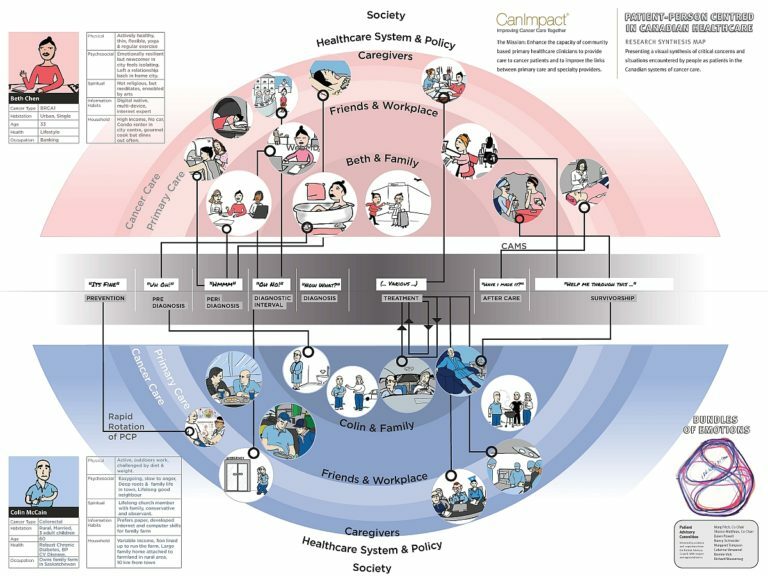 Synthesis maps are particularly effective in representing multi-level social systems such as are common in healthcare – indicating an outer boundary (e.g., national or provincial system), the service networks, agencies and specialized providers within a care context, for example. SFI student teams have also delineated sophisticated dementia journeys, evolution of health equity, and the developmental pathways of childhood obesity. A recent synthesis map was created by an sLab team for the SSHRC-sponsored Canadian Governance in the Digital Era, with the resulting map (here reduced in size), published in the March 2015 issue of Canadian Government Executive. The map draws on both foresight and system thinking models within a horizon scan of trends, values and weak signals for future innovation patterns. How Might Canadian Governance Be Transformed in the Digital Era? (cc 2015) Kelly Kornet, Goran Matic, Peter Scott, Jill Sharrock, Stuart Candy, Peter Jones, Patricia Kambitsch, Greg Van Alstyne. The typical synthesis map process requires a small team of graduate research assistants trained in the method, directed by a faculty advisor in a collaborative design process. Working through a series of drafts on paper and electronic modes, we start with a preliminary map, often sketched using graphic recording and rough free skecthes, followed by an integration of core concepts. Iterative refinements are made with sponsors/stakeholders to interactively integrate their insights and proposals with the design team's system maps. The move toward final synthesis and visualization progresses through studio workshops and team design and critique. The CanIMPACT project (Canadian Team to Improve Community-Based Cancer Care Along the Continuum) is a multidisciplinary pan-Canadian program studying how to improve cancer care to patients in the primary care setting. Funded by the Canadian Institutes of Health Research for 5 years (2013–2018, Grant no. 128272) the project was led by Dr. Eva Grunfeld, Director of Research at U Toronto's Dept of Family and Community Medicine. For the CanIMPACT synthesis map project, our sLab team (Jones, Smriti Shakdher, Prateeksha Singh). Two synthesis maps were prepared to reflect the discovered insights from the multi-year investigation, a clinical system map and a patient-centred map informed by the CanIMPACT Patient Advisory Council. The resulting maps were published (a first for a system map method) in Current Oncology and presented at the first Canadian Partnership Against Cancer (CPAC) conference, and MedicineX 2017. Jones, P.H., Shakdher, S. & Singh, P. (2017). 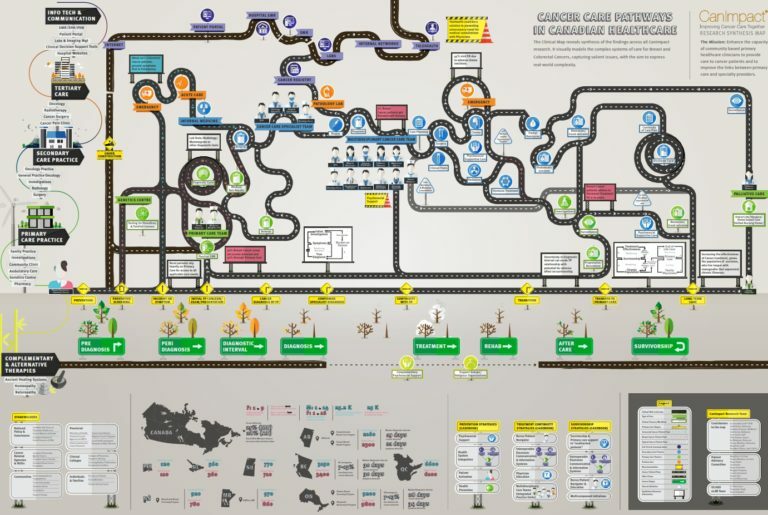 Synthesis maps: Visual knowledge translation for the CanIMPACT clinical system and patient cancer journeys. Current Oncology, 24 (2), 129-134. This project exemplifies well how the synthesis mapping approach can lead to high-quality representations of insights from complex research, how deeply deliberated discourses within a clinical or scoial research team can be articulated as systemic models, and how new knowledge production can be further developed toward strategic design outcomes such as program strategies and policy interventions. The two maps are presented as follows. Grunfeld, E., & Petrovic, B. (2017). Consultative workshop proceedings of the Canadian Team to Improve Community-Based Cancer Care Along the Continuum. Current Oncology, 24(2), 135. Discussion of the “two solitudes” or disconnected practices of primary care and oncology are described in Eva’s second article in the same issue:Grunfeld, E. (2017). The two solitudes of primary care and cancer specialist care: is there a bridge? Current Oncology, 24(2), 69. The Current Oncology article presents a simplified summary of the design action research process we used in developing the synthesis maps in the CanIMPACT project. These steps would be representative of an evidence-driven approach, and while not all synthesis maps are models of system knowledge from evidence, it is a well-suited technique for a range of complex knowledge problems in healthcare, medicine, communty and mental health, education, social policy, and other institutional and policy sectors. ■ Domain and Literature Review A scoping review of the CanIMPACT study and its references was conducted. Continuous searches informed emergent questions for representing mapping decisions. ■ Expert Interviews and Content Analysis, with Visual Notetaking. The CanIMPACT qualitative study, the Casebook survey of cancer initiatives, and administrative data substudy reports were analyzed, guided by interviews with study area leads. ■ Knowledge Synthesis to Design Maps in Stages In collaborative sessions, maps were hand-sketched to represent salient findings drawn from content analyses. ■ Peer Critique of Electronic and Print Maps Structured critiques of the maps were held with the CanIMPACT and PAC experts at key stages of map development. ■ Iterative Map Design The clinical map was developed first, in stages that adhered to the method. The necessity for a patient-centred map was discovered during the peer critique step. Systemic Design Research Network is a cooperative educational group founded in 2011 with a mission to advance the practice & theory of systems-oriented design. To advance the knowledge, theory, and publications in the domains of systems-oriented design and industrial and social systems design methods in systemic practice. SDRN extends its mission as an OCADU research group located within Strategic Innovation Lab (sLab). As Prof, Jeremy Bowes and Dr. Peter Jones have developed the primary courses in Systemic Design for OCADU's Strategic Foresight and Innovation program, we have trialed (and erred) enough to recognize and validate highly effective approaches to quickly and powerfully combine social research, expert studies, stakeholder workshops and mapping to inform systemic services and societal innovations. We have several years and courses of Gigamaps demonstrating the deep synthesis and creative research from student teams. We have SFI graduates now employed in the government of Alberta's systemic design policy innovation group. The SDRN was founded at AHO, Oslo School of Architectural and Design, in partnership with OCAD University, Toronto and is organized by a standing committee of four co-organizers Birger Sevaldson, Peter Jones, Harold Nelson, and Alex Ryan. SDRN is a cooperative association based on both academic and industry relationships, and invites faculty and students worldwide to participate in events and share research. We are a member group of IFSR and host a moderated, open online community. RSD participants are invited to join the online forum, and are welcome to participate with us in future activities: workshops, publishing, symposium events. Systems theory and design developed clear interdisciplinary connections during the era of the Ulm School of Design and Buckminster Fuller's design science, resulting in the design methods movement (informed by Rittel, Alexander, JC Jones and Archer). However, in the recent decades this co-evolution has not persisted, as each field has specialized in preferred core disciplinary methods. Practitioners in both systems science and design have attempted to entail the more effective models and techniques from the other field, but usually in piecemeal fashion, and only if a problem was so suited or if supported by clients. Systems thinking has generally considered design thinking a soft complement, or analogous to creative planning. Design schools and consulting practices have developed well-packaged presentations of "systems change" approaches, but these are poorly supported by systems theory, interdisciplinary courses or rigorous systemic methods. There are significant societal forces and organizational demands impelling the requirement for "better means of change." As Fred Collopy (RSD2) wrote in Fast Company several years ago, the (2nd gen) systems movement may have failed us and we're not yet sure if design thinking will restore its promise. As Jones (2009) replied, systems thinking never had a chance, the way it was presented in the last decade - so perhaps it might be redesigned as a discipline. Now we call on advanced design practice to lead programs of strategic scale and higher complexity (e.g., social policy, healthcare, education, urbanization) we have adapted systems thinking methods, creatively pushing the boundaries beyond the popular modes of systems dynamics and soft systems. Systemic design is distinguished from service or experience design in terms of scale, social complexity and integration - it is concerned with higher order systems that entail multiple subsystems. By integrating systems thinking, theory and appropriate methods, systemic design brings human-centred design to complex, multi-stakeholder service systems. It adapts from known design competencies - form and process reasoning, social and generative research methods, and sketching and visualization practices - to describe, map, propose and reconfigure complex services and systems. Jones, P. (2014). Design research methods for systemic design: Perspectives from design education and practice. Proceedings of ISSS 2014, July 28 - Aug1, 2014, Washington, D.C.
Jones, P. (2014). Systemic design principles for complex social systems. In G. Metcalf (ed. ), Social Systems and Design, Volume 1 of the Translational Systems Science Series, pp 91-128. Springer Japan. Nelson, H.G. & Stolterman, E. (2012). The design way: Intentional change in an unpredictable world. Second edition. Cambridge, MA: MIT Press. Sevaldson, B. (2011). Gigamapping: Visualization for complexity and systems thinking in design. Proceedings of the Nordic Design Research Conference. Aalto University, Helsinki, Finland.